The second of Dave Paul’s massive 101-spell books centered on terrain-specific spells clocks in at a whopping 42 pages, 1 page front cover, 1 page editorial, 1 page SRD, 2 pages of advertisement, leaving us with 37 pages of content, so let’s take a look! We begin this pdf with spell-by-level-lists, containing, btw. also the ACG bloodrager and shaman – and then, we’re right at the spells. I’m not going to go through the spells one by one, instead trying to provide a showcase of the best and worst of the bunch – so let’s dive in! At low levels, better options to forage for food and water can be found – but thing become interesting pretty immediately after that – let’s take a cloak of acidic mist: In a 5-ft.-radius around you, you generate acidic mist that moves with you -and it lingers, decreasing its damage by two dice per round – the issue becomes pretty much apparent for all spell-designers – in order to move, you’d have to pass your own acidic cloak’s first 5-ft.-AoE, thus dealing damage to you when you move. Know what? the wording manages to elegantly fix this rules-language conundrum. And yes, I consciously do not say how here – I won’t you folks to take a look at this. Much like in the predecessor book, casting the spells herein in the correct, wooden environment, obviously increases the spell’s prowess – which may translate to numerical increases of the spell’s parameters. But the pdf actually goes one step beyond that – you see, there are several different forests (D’UHHH) – and quite a few spells herein have different effects when cast in e.g. cold or temperate or warm forests. This would be pretty much “going the extra mile” as far as I’m concerned. Indeed, this adds a strategic component to the pdf I did not expect to see in such a pronounced manner – the spells here, in short, manage to tie the aspect of magic and the world in which it is cast even tighter together than the previous book. Beyond terrain variants, there also would be spells that allow you to emulate different aspects of trees, thus granting the type of buff you require in a given situation. Another component I enjoy about the spells herein would be that they act as a kind of roleplaiyng catalyst in quite a few of the cases – buffing yourself to become an aurumvorax may have nice imagery, yes. But the spell becomes cool when it states that this prompts a powerful drive to act alone…and rewards you when you go solitary on your scouting rounds. See, that’s how you make spells that enhance roleplaying by granting tangible benefits, providing a unity between crunch and fluff. Calling bear guardians to perform either tasks or be on guard duty is interesting due to the LONG duration of the service – and if you’re like me, you immediately looked for the obvious army of bears-exploit – guess what? The spell has a caveat that prevents it. Purging the undead, outsiders and constructed from the area may sound okay – until you realize how hard this spell is – with variable alignments and the option to purge them in large areas of the caster’s home, one pretty much immediately realizes that the rules-language here is not something any designer could have crafted – beyond that, though – the spell also manages to represent pretty neatly the trope of home-advantage, of the requirement to get the powerful druid back in time to halt the encroaching horde – Love it! Druids cultivating flower-based plant-guardians will appreciate the cantrip that allows them to bloom faster. We also know the trope of undead, held together by plant-matter – well, the spell’s in here for the root-suffused undead. High-level druids may actually call a powerful hamadryad to their aid. On the iconic image side, what about bards conjuring forth a chorus of nonlethal damage-dealing, deafening cicada chorus – oh, and if there actually are cicadas around, you’ll definitely enjoy the proper power-increase. What about conjuring forth a variant of solid fog that deals damage…and is particularly nasty versus cold iron-susceptible creatures while ALSO acting as a combo-set-up for certain damage-types? Yes, that would be an interesting terrain-control spell! Conjuring forth curtains of swirling, autumnal leaves, dropping branches on your foes, summoning rot grub swarms – the spells range from absolutely glorious to intriguing. Declawing temporarily animals, reducing the efficiency of their claws, is pretty cool. Psychological warfare via eyes in the dark and a series of interesting fey form-spells further supplement this obvious thematic connection – speaking of fairytales – what about a compulsion that takes grains of a fine material and compels the targets to count them? Yes, this resonates with our real world mythology perfectly and puts it into concise game terms. The pdf also continues the absolutely awesome innovation utilized in the first such book – there are spells which allow you to designate a target creature as a friend of the forest – hereafter, you can call such beings to your aid via other spells. Once again, this type of magic ultimately allows not only for interesting tactical options – it provides an in-game rationale for terrain superiority of a certain group of beings and has roleplaying potential, friendships and the like, all rolled up in its frame. Love it! You and your allies may also transform into sparrows (great for reconnaissance), gain a slightly more flexible form of feather fall (at an appropriate level, btw. ), render forests truly labyrinthine for those succumbing to your magic. What about coating allies in acidic repellant? Sounds okay? Well, it is. It goes that extra mile by featuring information on how it can be dissolved and countered – it’s these small bits, not necessarily required though they may be, that add this sense of magical realism to the spell-books, that make them feel like they’re part of a concise setting. There also is an interesting terrain-control variant of healing – create a gorgeous, glowing garden – each square traversed heals(or harms the undead) – when fighting the living dead, this definitely is intriguing – and it may free the healer to do other, awesome things – interesting indeed! 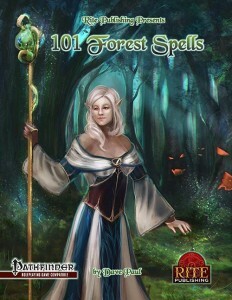 There also would be quite a few spells that let you duplicate some of the iconic tricks of various fey and there also would be the powerful 9th-level ritual that renaturalizes 10 miles of land – reverting the natural order in the area – whether at the PCs or NPC’s hands, this is an adventure on its own. Need to conceal the rather anti-stealthy, clunking Joe Platemail-Fighter? The Spell’s in this book. If you’re on the less scrupulous side, summoning a moonflower may offer a rather creepy ally. Oh…and you can temporarily make a tree. With full stats, hardness and everything. need a tree? Cast Tree! You may be stumped as to why I consider this awesome, but the sheer plethora of things you can do with this spell if you’re creative is pretty impressive – if you need some ideas, drop me a line! Another star should be mentioned: There is a spell that allows a creature to bound itself to a forest in exhange for more power – spells like this make the trope of creatures with their own domains and stalling feuds between terrains and dominions so much more believable! Editing and formatting are top-notch, I noticed no glitches. Layout adheres to Rite Publishing’s two-column full-color standard and the pdf comes fully bookmarked for your convenience by spell-level, spell list AND individual spell! The pdf sports numerous absolutely gorgeous full-color artworks. 1) His rules language is precise, even when tackling highly complex spell-effects. 2)The general power-balance of the spells is well-reasoned and so far, I felt no need to complain about any spell being OP. 3) The spells go above and beyond in tying their effects to terrain by rewarding players for planning and making them feel unique and magical. 4) The spells feature unique visuals from our shared mythologies and put them into concise rules. 5) They do so in actually innovative interesting ways that emphasize player-agenda, while showing his experience in academia and teaching – even complex concepts are conveyed in concise and easy to grasp ways. One great spell book is an occurrence – two are a tendency. This is pretty much a textbook example of what a spell-book should be – inspiring, intriguing, exciting. Here, the crunch actually makes you come up with storylines, plots and enhances narrative options rather than limiting. This is a great example of Rite Publishing’s key-strengths of evocative concepts married with neat crunch and well worth a final verdict of 5 stars + seal of approval, given without hesitation – I consider not a single spell herein problematic. Not one. Get this! You can get these great spells here on OBS!